These Groups are NOT YOUR ENEMIES. These Groups are NOT YOUR FRIENDS. This is my review of the iMindMap application, Version 11. Since I started reviewing programs for creating mind maps, I have always rated iMindMap as the best of the lot. I have further gone on to say that iMindMap is the best application I own for promoting, improving, motivating, and perfecting visual thinking. With this version, iMindMap continues to evolve while it retains its position as the leader in mind mapping software. In a way, iMindMap is no longer a mind mapping program in a narrow way. Rather it is the very best program for creating mind maps of any I have ever used. But, in addition to being the best mind mapping program, it contains 6 additional integrated modules that make it into the best integrated visual thinking product on the market. What is a VIsual THinking ENvironment (VITHEN)? Click here to find out. The most important way that iMindMap transcends a traditional mind map is that the tools provided for mind mapping almost automatically push you into thinking about your topic in a more sophisticated and complete way. It promotes better classifications of ideas, priorities, impact, outcomes, mediating steps, and theories in a way that is so intuitive it is almost like magic. That is, what you know about mind mapping and how to use it effectively, will automatically “in the background” evolve to an even higher level of visual thinking. The iMindMap program includes a total of 7 interrelated modules that can be used in combination to understand ideas and produce documents that easily communicate your findings. The iMindMap program also includes dozens of tools and techniques that extend the usefulness of the programs. While the Mind Map module is the central focus and will be the entry point for almost all, other modules supplement input, idea presentation, and specialized applications. It is the overall interaction of these modules that create the thinking environment. My position is that mind maps are a powerful tool for creating, clarifying, and presenting THOUGHTS. So, I’ve always presented my reviews as mind maps in the past. I continue that tradition here. Please click on the image to increase its size and see a classification and evaluation of the overall thinking environment including the best mind mapping module available. This program is a brilliantly conceived thinking system and environment. While the app will continue to evolve over time as it has annually since the beginning of the century through tweaks to current procedures and new breakthroughs, iMindMap as it currently exists is the premier product for supporting innovative and creative thinking and communication. I strongly believe that the iMindMap program will help promote better quality thinking for most of those of all ages over 12. I also strongly believe that mind maps and visual thinking environments will be extremely useful for at least some individuals with declining cognitive skills, especially if they start mind mapping before the onset of cognitive decline or during early stages. I base that conclusion on my own experience in using this program and others to extend the period of minimal cognitive decline that occurs during a neurological disease, as a consequence of trauma, or other myriad problems. I have neurological disease and dementia. When I first started mind mapping using iMindMap, I was in an early-mid stage of dementia. My early reviews of the program (more than 5 years ago) took me approximately 2-4 hours to mind map and write the accompanying text. In later years, it took more time over more days. I spent at least 8-12 hours working on the mind map here and writing this review over more than a month. The production of the review was slowed down by my own feelings of not having energy and feeling apathy to various degrees. BUT, I was still able to produce a full review of comparable quality to my own reviews of the past after so many years have passed. That is a better outcome than I had expected when I started in 2010. 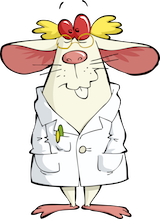 All of the blog posts I have made and all of the mind maps I have developed over the years occurred when I was in cognitive decline and all are on this blog site. The timeline on the left of each web page will allow you to compare the mind maps I could produce years ago with those I now produce. All current mind maps since July 2018 were developed with iMindMap 11. Over the years I have used virtually all of the competing mind map products both on the Mac and on an iPad. I could not have developed my own mind maps with the other programs and achieved the same outcomes. While everybody hopes that the software they need to use is provided for free, iMindMap is far beyond any free or low-cost software. It is also as suitable a way to learn mind mapping for the first time as it is as a professional tool. I see the programs current pricing as appropriate for the high value of the thinking environment. This review used the Mac version of iMindMap 11. What I have been achieving with mind maps during cognitive decline? Click here for more information. To access all of my prior reviews of iMindMap (since Version 3), click here. Now that’s a cryptic title for a blog post, isn’t it? When you move into later stages in dementia, there are some additional challenges to deal with. Apathy (A) like you have never felt apathy before. Anxiety Avoidance (A+A) where the primary experience is often trying to stay away from events, people, and situations that cause you anxiety, to a large part because the experience of anxiety gets harder and harder to cope with. The Bursting Bubble (B+B) phenomenon wherein strategies you have used successfully in earlier stages of dementia to maintain quality of life no longer work so well. Confusion (C) as a daily part of everything you do increases 10-fold. Communication (C) becomes less automatic, more idiosyncratic to you, much harder because words disappear on the way in and on the way out, slower, ambiguous, more frustrating to you and those you are communicating with, and possibly without any memory of things you said 5 minutes, 5 hours, 5 days, or last Thanksgiving. Sounds like a recipe for disaster to me unless you take active (and hard) steps to maintain quality of life under different conditions you have encountered before. The following mind map shows the problems involved with moving into later stages of dementia and some solutions that might work for you. Skills and techniques you learned at early and middle stages of dementia will be helpful but not sufficient to fully deal with the continuing challenges of maintaining quality of life. Can it be done? Yes. Is it easy without a plan? No. Does a plan help? Yes. Here are some explanations of what might be happening to you (or an individual under your care) as dementia progresses. Click on the image to expand it. A few solutions for each problem are also suggested. Note that these are general suggestions and NOT medical or psychological advice. For more help, see your healthcare provider(s). Exclusive news flash … the contents of an iTunes playlist on Putin’s iPhone. Since most Americans, including the one residing in the White House, know little about Russia’s history, here is a tutorial that can be played on Fox News so that POTUS will see it. The tutorial is easy to understand while eating Big Macs and does not require reading skills beyond those acquired by the age of 10. A lot of Americans think Paul McCartney wrote this new Russian National Anthem. They are mistaken, but the Beatles song is a lot more catchy than that of the USSR. Putin loves it. Russian National Anthem as revised under the regime of Vladimir Putin. An alternate Russian national anthem was used during the regime of Boris Yeltsin; Putin restored the original USSR national anthem in 2000 with lyric edits after replacing Democracy with Oligarchy. I have no idea why Youtube has this labeled as the German Anthem. Vladimir Putin sings the national anthem surrounded by 130,000 disenfranchised citizens of Russia. At least he seems to be able to sing his national anthem better than Roseanne Barr can sing ours. Hopefully, after November 6, 2018, the anthem of the Soviet Union (AKA Russia) with edited lyrics will not replace the Star Spangled Banner. As a point of comparison to Putin, click here to see some infamous performance of the USA national anthem. A few years ago, I introduced the term VIsual THinking ENvironment to describe applications that provide a number of visual thinking tools like mind maps, concept maps, flow charts, diagramming, statistical graphics, and visual representations of models, theories, and new knowledge in an integrated way within a single application. As I used and experimented with new (or newly revised) mind mapping applications every year, I noticed how they were evolving from mind mapping to thinking environments by continuing to implement new and easier ways to process diagrams, figures, photography, sketches, doodles, and logic models together and build integration among tools that permit input visualization and visual output. The best (and right now the only) evolving mind mapping application to include related new or adapted visual information processing methods is iMindMap 11. It is the only application that provides a well-conceived suite of techniques to form a Visual Thinking Environment (VITHEN). I believe that iMindMap should be rated A++ as a mind mapping program and A as an evolving VITHEN. I fully expect the entire iMindMap 11 suite to be as useful and developed as the mind mapping module within an iteration or three. So, what is a VITHEN? 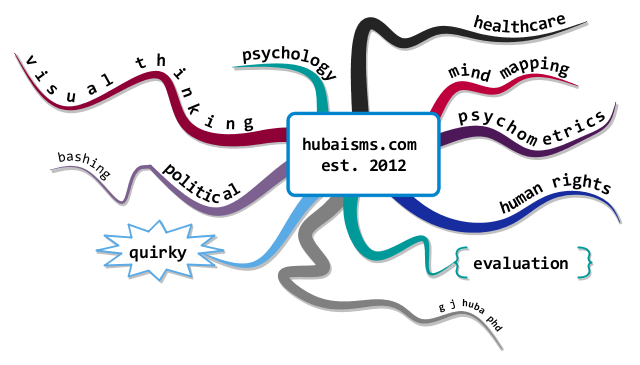 The following mind map (created in iMindMap 11) incorporates my definition. A fully developed VITHEN not only will produce mind maps and other graphics but most importantly encourages intelligent use in model and theory building and optimizing creativity and effective knowledge development and presentation. The next posts include a “formal review” of iMindMap 11, examples of advanced mind maps (which I characterize as MIND MODELS), and an analysis of advantages of a VIsual THinking ENvironment over traditional mind mapping and other graphic thinking tools. 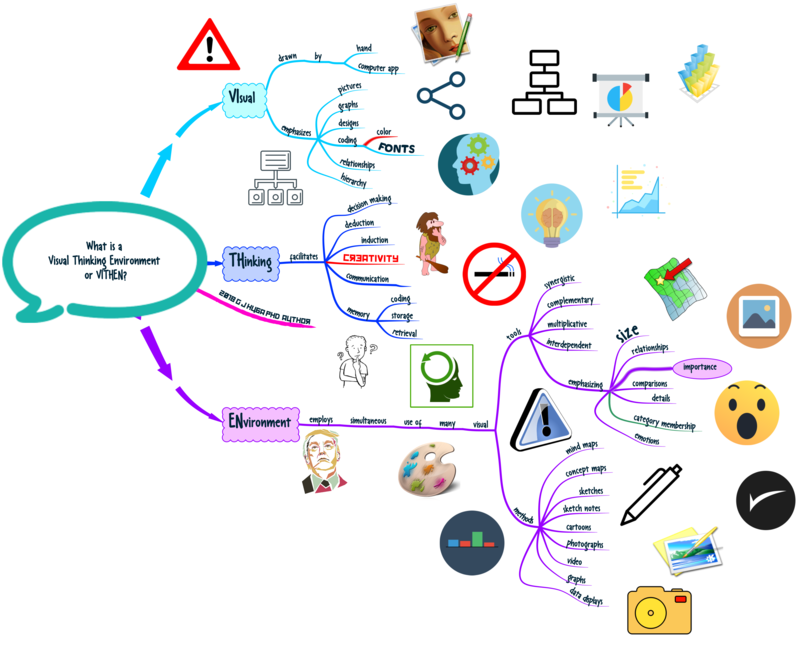 Click here for a full review of iMindMap, Version 11.